The long search is over, and unfortunately, it’s not a trap. Admiral Akbar, everyone’s favorite choice for the new mascot for the Ole Miss Rebels, didn’t make the final cut. 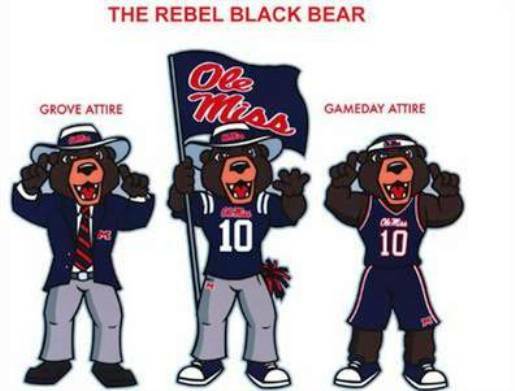 Instead, the three choices were the Rebel Black Bear, the Hotty Toddy (whatever that is), and the Land Shark. Of course, the coolest of those three choices (the Land Shark) didn’t win; instead, the winner was the Rebel Black Bear, the new mascot of the University of Mississippi. Ole Miss dropped their former mascot 7 years ago, noting Colonel Reb’s connection to Ole Miss’s segregated past and historically racist overtones. I guess I just didn’t know Mississippi had bears.